Porec is one of the most popular tourist destinations in Croatia. 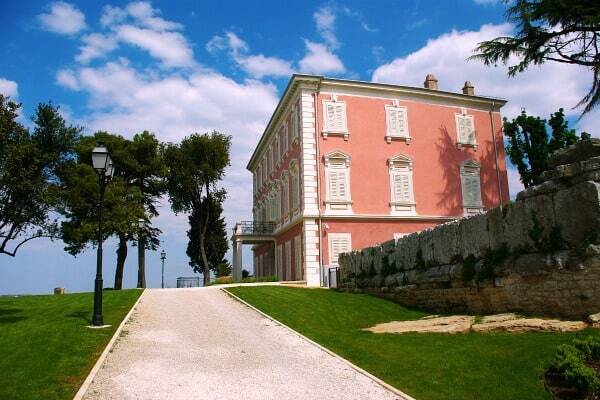 Located at the west coast of Istria, this pictoresque coastal town attracts more than 400.000 visitors a year. Porec is also a place we call home. And while we haven't chosen it but it was rather our work that brought us here, today we are more than happy to live in Porec. And while other places might be prettier (hello Rovinj! ), or offer better restaurants (hello Rovinj again! ), Porec can make a perfect base to explore the peninsula, 'cause it has a good balance of nightlife, family activities, sport offer, beaches, and hotels. Here is an overview of things to do in Porec (in no particular order). Located in Zelena Laguna Resort, Ski Lift is the only cable water ski and wakeboard park. Skilift has a 700 m of cableways and five kickers available for fun jumps. Cables have two speeds: 30 km/h and 58 km/h. There is a bar onsite serving also quick bites like french fries, and burgers. This is an excellent place to chill out with a drink even if you aren't into waterskiing and wakeboarding. Locals love to have a coffee at the Skilift on sunny morning. Porec is popular destination among cyclist, both professional and amateurs. Many professional teams make Porec their base in early Spring for training sessions. There are also few cycling races throughout the year like Porec Trophy, one-day professional race that takes place in March. Amateur and family cylists will enjoy many cycling trails in and around Porec. The easiest and perhaps the most popular one is from Porec along the coast to Zelena Laguna Resort. This trail is mostly flat, asphalted and car-free. There are lots of pedestrians on a trail, and an electric train passes every 20 minutes. This trail continues through Bijela Uvala campsite further to Funtana, where it turns inland through Agrolaguna vineyards, and further to the villages of Fuskulin and Mugeba back to Porec. This trail partly passes on a village roads. Instead to turn back to Mugeba and down to Zelena Laguna, you can instead continue from Fuskulin further to the villages of Dracevac, Zbandaj and Bacva back to Porec via Antonci. Or you can turn from Fuskulin to the villages of Jasenovica and Flengi, and then further to Klostar and Lim Bay and back to Vrsar. From Vrsar you go back to Porec via Funtana and Zelena Laguna Resort. In and around Porec, you've got ample possibilities for wine tasting. Agrolaguna Winery has the most convenient location, right in Porec (no car required). Agrolaguna is the largest wine producer in the region. They offer two different wine tastings: standard and premium wine tasting. Regular wine tasting costs 9€ per person and it includes tasting of their three wines accommpanied with a tasting of two extra virgine olive oils, and two cheeses. A premium wine tasting costs 13€ per person, and it includes tasting of their five wines, three extra virgine olive oils and two cheeses. Both wine tastings include a guided visit to their wine cellar. Damjanic Winery is located in the village of Fuskulin, 5 km southeast of Porec. This family-run winery produces six different wines: white wines Malvazija, Akacija, and Chardonnay; red wines Borgonja and Clemente, and a dessert wine Muskat. Visits are possible daily throughout the year, by appointment. Tasting is free as long as you buy at least a bottle :). Persuric was one of the first wine makers in Istria to make a sparkling wine back in 1990s. And he still does it! His sparkling wine Misal is what Persuric is known about, while other wines like Istrian Malvasija, and Muscatel, he only makes in small quantities and offer them for tasting exclusively at his winery. Persuric Winery is located in a village of Prsurici, just few kilometers east of Porec. Wine tasting is available all year around, Monday to Saturday, by a prior appointment. Porec has lots of beaches, spreading from Cervar to the northwest to Zelena Laguna Resort to the southeast. The most popular beaches are Pical, Brulo, Porto Busola, and beaches in Zelena Laguna Resort. Porec coast is mostly rocky, and so are the beaches. But within resorts many beaches are manmade with cemented sunbathing areas, and shingle swimming areas. All Porec beaches offer lots of space, and the most important lots of shade under the pine trees. You can spend an entire day at the beach. There are lots of water sports to enjoy, deck chairs, sun umbrellas, boats and jet skis to rent, sand pits and playgrounds for children, bars, restaurants and designated areas for dogs. For further reading check our full post on beaches in Porec. Whether you like to have a glass of wine while watching the sun sets, or you want to dance a night away, Porec has you covered. Town offers a decent choice of bars and clubs, and generally has a very good nightlife. Popular bars are Tequila, Saint & Sinner, Villa Club, Old Time, and Epoqua. Read our full post on bars, clubs and nightlife in Porec. Aquacolors is a waterpark located on the main road Porec-Vrsar, just across Zelena Laguna Resort. The water park open in May 2015. You can read about our experience at the water park Aquacolors Porec. 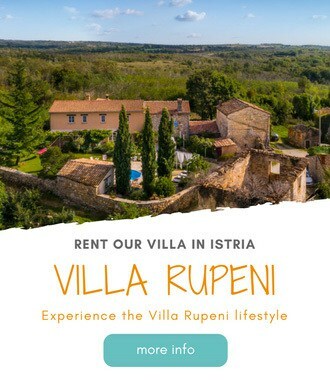 Or, you can also visit Istralandia, another Istrian water park, located 30 km from Porec. Porec old town is located on a small peninsula, surrounded by the sea. To this day, Porec perserved a typical layout of an ancient Roman town. Streets's layout is symmetrical with two main intersecting streets and Forum: Decumanus Maximus running east to west to the main square – Forum (today Trg Marafor), and Cardo Maximus connecting north and south. Porec's Euphrasian Basilica dates back to 4th century, and today it's UNESCO's World Heritage Site. Other attractions include Neptun's Temple, Romanesque and Gothic houses like House of Two Saints, and Zuccatto Palace, round and pentagonal towers, and Istrian Council House. At many Porec beaches you'll find the amplitude of water activities to enjoy. The most common are: jet ski rental, banana ride, tubes, and para-sailing, as well as boat and pedal rental. Renting a jet ski for 15 minutes will set you back 250 Kn. An hour on pedal boat costs anywhere between 50 Kn and 70 Kn. Exploring Porec coastline on your own with a rented motor boat will set you back 1.200 kn a day. Banana ride goes for 50 Kn a person while tube ride goes for 80 Kn a person. Renting a deck chair for a day will set you back 25 Kn, and an equal amount for renting a sun umbrella. A one-person kayak rents for 30 Kn an hour, and two-person kayak for 40 Kn per hour. I said it many times at this blog, and I'll repeat it again – Istrian olive oil is excellent, and one of the best in the world. And while you are in Istria, don't miss to taste it. Maybe even bring some home. I've been reading this great book by Tom Mueller, Extra Virginity: The sublime and scandalous world of oil olive. If you are curious about the book, it's available through Amazon. Anyway, one conclusion I made after reading it is: Take care what olive oil you drink, where you buy your it, and how much you pay for it. In Porec there are many small producers who make extra virgin olive oil of great quality. We buy it in bulk, from a guy in a village of Tar. His oil sells for a 100 Kn a litter. I'm happy to share his contacts if you are interested. Just send me an e-mail. You can book an olive oil tasting tour with Agrolaguna Porec, either as a part of a wine tasting tour or as a separate experience. The tour costs 9-13 € per person. Agrolaguna also packages an assortment of their oils in a gift box. It makes an excellent souvenir or a gift to bring back home. You can buy it at their small shop, just outside of Porec green market. It sells for 150 Kn. A small underground cave, located near Nova Vas, 5 km of Porec, Baredine Cave is a popular natural site near Porec. A guided visit takes 40 minutes. The path is 300 m long it passes through five chambers and it descends 60 m down to the underground lake. The lowest point of the cave lies at 132 m below the ground. Cave's temperature is at 14°C year around. Onsite you'll also find a parking lot, a reception, a bar serving also simple food, a children playground, and a permanent exhibition of old tractors. Entrance fee is 60 kn for adults, and 35 Kn for children (6-12). Children below 6 years of age are free of charge. Many events take place in Porec, especially from June through September. A historical festival, Giostra takes place the second weekend of September. The festival brings Porec back to 18th century, to Baroque times through clothes, performances, plays, dances, games and food. You can read more about Giostra here. 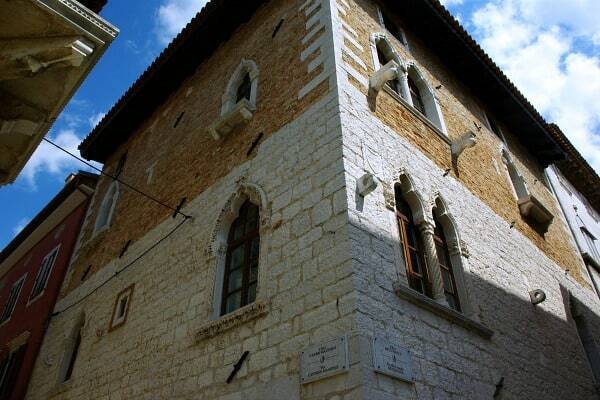 For almost twenty year, a lapidarium of the Porec Heritage Museum is a home of jazz in Porec. Live concerts, known as Jazz in Lap, take place every Wendsday in July and August. Porec24 takes place in June. It marks the opening of the summer season in Porec with live open-air concerts, cheap local food and wine, tons of people and a great atmosphere. May is a month of wine celebrations in Porec with Vinistra, the largest wine fair in the region, Open Wine Cellars Day, and Malvasia fest. Vrsar, a small coastal town 10 km south of Porec, has a small airport. Aeropark Vrsar offers panoramic flights, tandem jump, and piloting programs. Panoramic flights take off from the airport in Vrsar daily from 9 am to 9 pm from April through October. A 10 minute flight over Vrsar, Lim Fjord and Rovinj costs 140 Kn per person, a 15 minute flight over Vrsar, Rovinj and Porec costs 170 Kn per person, a 30 minute flight over Vrsar, Rovinj, Porec, Novigrad and Umag costs 300 Kn, a 30 minute flight over Vrsar, Rovinj and Brijuni Islands will set you back 340 Kn, while a 45 minute flight over Vrsar, Poreč, Motovun and Grožnjan costs 450 Kn per person. Tandem jump is 1.500 kn, with additional 250 Kn for a GoPro video clip, or 600 Kn for a professional video clip. Dinosaur Park is set in an ancient quarry in a village Funtana, half-way between Porec and Vrsar. Thick pine forest surrounding the park ensures good shade, and cool breeze even on hot summer days. With over 1500 m of paths, dozens of life-size electric dinosaurs, variety of amusement rides, and small farm Dino Park is a great place to visit with children. The admission fee costs 100 Kn for adults, and 80 kn for children. The park is open from April through October, while the show arena within the park works from June through August. While staying Porec for your holidays in the Adriatic, take a day out to visit Venice, the floating city and one of the most beautiful towns in all world. It's easy to reach Venice from Porec, either by car, tour bus, or by boat. Catamarans run from April through September. In July and August, catamarans for Venice leave daily from Porec harbor. Two companies operate catamarans. Venezia Lines and Kompas. The ride takes 2.30h each way. Departure from Porec is at 8 am and the boat leaves Venice at 5 pm. Venezia Lines tends to be more expansive with a return ticket cost at 120€ per adult, and 75 € per child (4-13 years of age). Children below 4 travel for free. The return ticket for adult with Kompas costs 65€. Both companies run regularly special deals, especially in shoulder season. Check their websites for the best deal. You can also visit Venice on a coach as a part of group tour. Probably the cheapest but least hustle-free way to visit Venice is by car. It takes 2.30h to reach Venice (but bear in mind that lines at Croatian-Slovenian border can be long in July and August). The best place to park a car is the Tronchetto Parking. It's at the entrance of the town, easy to reach, and it's huge. The daily ticket costs 21 €. Check their website for further info. 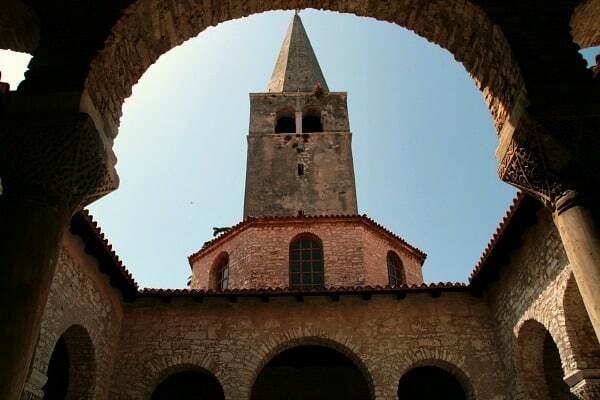 The most visited Porec's historical site, the Episcopal Complex of Euphrasian Basilica is the UNESCO World Heritage Site. A true example of Byzantine architecture, the episcopal complex includes a basilica, a sacristy, a baptisery, and a bell tower. The complex has retained its original shape from VI century for the most part, but it features some of the elements from the previous periods, like famed mosaic floor dating back to V century. The regular mass service is held daily (Mon-Sat 7.30 am and 7 pm | Sun 11 am and 7 pm). Basilica is open for visits a year around. An old railroad connecting Trieste and Porec, called Parenzana, presents today a popular tourist trail especially among cyclists. Since 2014 you can also experience the trail aboard an electric train that runs between Vizinada and Motovun. The round trip takes at least three hours, and if you decide to explore Motovun on artival or have a lunch there, it can take longer. The round trip costs 130 kn per adult, and 65 kn for children below 12 years of age. Finger food, and wine served halfway through the ride will set you back additional 100 kn per person. Have you been to Porec? Are you planning to go? What's your favorite things to do in Porec? Let us know in the comments below. looking for a day trip to Porec or closer beautiful Croatian city /town to us for Sat August 26th . WE will be staying just in Trieste . Afraid there will be traffic at border… true? Any suggestions . Would like to depart Trieste at 9am and be back by 6pm . thank you ! It would be better if you depart Trieste a bit earlier, to avoid traffic at the border (not that you will completely avoid it, but at least have it less). Also, return can be a bit later. Visit to Rovinj is the must, and if time allows, visit Porec as well. Enjoy it! I have enjoyed reading the many helpful tidbits as we prepare for multigenerational trip. questions….1. Can you please share where you buy your olive oil as mentioned above? 2 plus. I think we will take the ferry over to HVAR for the day instead of the boat rental ….how walkable is the docking to the main area of HVAR for sightseeing….we have a vehicle is it work taking it on the ferry? booking in advance? hiring a guide once we are in HVAR either with our vehicle or walk-on ferry and tour guides vehicle there…it is a bit tricky because there are 5 of us. We are staying in Split and Rovinj over a week. 3. We have our restaurants booked for Split…any great recent suggestions for Rovinj and for our journey from Pula to Zagreb. 4. Traveling back by van through Solvenia from Zagreb….to Austria….any suggestions where to stop for lunch on this route as well? 5. Finally is Laterna (Red Island) really great…or are there many restaurants in Rovinj area that are equally delightful? 1. We buy it in a village of Tar, from a farmer named Viktor. Email us for the contact details of Viktor. 2. Ferry in Hvar town docks right in the harbour. taking a vehicle only makes sense if you want to explore other places on the island, and not only Hvar Town. 3. In Rovinj, book restaurant Barba Danilo if you like seafood. It’s the best! 4. Unfortunately we don’t know well this route, but if you don’t mind exploring a bit Slovenia, restaurants in Goriska Brda region are our favorite, we particularly like La Subida (on the Italian side of the border). 5. Lanterna is ok, food is good, and location is lovely, but there are other restaurants in Rovinj better than Lanterna: Barba Danilo, Jure, Giannino, are all great. I can’t find out when Porec24 2017 is taking place, do you know the dates by any chance? And is it hard to get accommodation during it? We will be in Croatia in June. I love your blog already! Beautiful Images and Interesting Article…. I Like Your Post………. Frank, Croatia is so beautiful that I am absolutely determined to go visit some of its beautiful beaches this summer. I’m so frustrated that I couldn’t visit it while I lived in Romania, but at that time nobody was allowed to travel outside the border (except for the secret police…).